When I decided to kick my cubicle to the curb, I jumped right in. There was no plan. No goal. No idea what I was doing. In hindsight, this wasn’t exactly the right way to go about leaving the corporate world in favor of a cubicle-free career. At the time, I reasoned I knew how to write a resume and had my fair share of in-person interviews. Surely this real world job search know-how would translate to a remote job search, right? Not exactly. As it turns out, a work from home job search is a much different beast than a traditional one. My inexperience in the world of work from home led me to some spammy corners of the Internet. And instead of making progress in my job search, I felt stuck. My total lack of understanding stalled my job search. Big time. Fortunately, I lived through those mistakes and learned a thing or two along the way. Once I knew what I was getting into and, more importantly, what I was looking for, I was able to finally make the progress needed to land the right remote job for me. And because I already made these mistakes, you don’t have to! In fact, once you make the decision to work from home, there are some simple steps you can take to prepare yourself for a successful remote job search. Because a successful remote job search actually leads to a work from home job, which is the whole reason you’re starting this journey in the first place, right? Many people say they want to work from home as if working from home in and of itself is a job. I know I was guilty of this. You can land a work from home employee position. You could strike out on your own as a freelancer. You may even want to try your hand at online entrepreneurship. Each type of employment has its pros and cons. Knowing what those are will help you determine which one you favor or need to pursue based on your current availability. 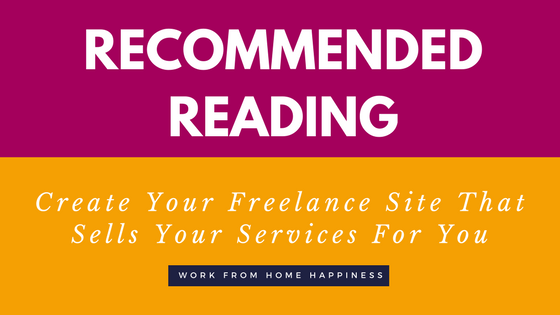 Generally speaking, if you crave flexibility and want to work around your existing life (and not the other way around), freelancing is the way to go. If, however, you prefer the stability of set pay and health benefits, the employee route is better suited for you. But don’t worry. Whether you’re thinking you’re more of a carefree freelancer or steady employee, there are PLENTY of opportunities available to kick your cubicle to the curb. The point is to determine which type of employment option you prefer (there is no right or wrong answer) so you can simplify your work from home job search by focusing on only those jobs that align with your goals. Now that you’ve decided which kind of jobs you’re going to focus on, you’re probably pretty eager to jump right in and start applying. But wait! First things first, you want to audit your online presence. A whopping 80% of hiring managers, recruiters, and potential clients will google you before they even consider working with you. In other words, what Google has to say about you can make or break your chances of getting hired. If you’re not sure how strong your online presence is, that’s okay. You can take steps right now to strengthen in. For starters turn to social media. People are going to scout you out on social media. That’s just a sign of the times we’re in today. Instead of being at the mercy of your profiles, take the proactive approach and clean them up to a polish that will impress even the most discerning recruiters. So, go through your profiles. Delete anything that may question your integrity as a professional. Now, keep in mind, social media isn’t just a place for recruiters to find reasons to dismiss you as a candidate. It can actually be the perfect place to showcase your personality — you just have to do it in the right way. This can be done by uploading PG pictures. Share news bits. Comment on articles related to your industry. Have fun and be yourself, just keep it clean! Whether you’re an aspiring freelancer or on the prowl for remote employee positions, remember, you are the CEO of Y-O-U. As such, it’s up to you to brand yourself as the type of person people want to work with. As a freelancer, this means you’ll need to set up a portfolio website. The purpose of this is twofold: helps attract new clients and gets people to hire you. It can be intimidating to create a portfolio from scratch, especially as a newbie. But it’s a lot easier (and more affordable) than you probably think. And the benefits of having your own slice of the Internet is well worth the time it takes to get your own site set up. Now, if you’re seeking employment opportunities, you may think you can skip the website. But you’re wrong. Having a professional website strengthens your personal brand. And, when you’re a remote job seeker, this can make you a standout candidate (which means more interviews!). Not only does a personal website give recruiters a chance to scope you out on a platform you have control over, it can help you achieve ‘expert’ status in your industry. By blogging, of course! Having a blog on your personal website along with your resume and contact information, can help you get found by recruiters and gives you a chance to show your stuff when it comes to your industry experience. I think it’s a universal truth that most people don’t like LinkedIn. I know I don’t. And even though it’s not my favorite networking site, there’s no denying how powerful it is when it comes to finding remote work as an employee and freelancer. You see, many recruiters scour the depths of LinkedIn every day on the hunt to fill job vacancies. And clients will simply post freelance gigs on LinkedIn and use their existing network to track down the right freelancer. As a remote job seeker, you’re doing yourself a great disservice if you’re not active here. And, as with everything else in the world of job seeking, there’s a right and wrong way to go about LinkedIn. Be sure you take the steps needed to be a professional on LinkedIn and not a nuisance! Once you’ve decided to work from home, figured out the type of work you’re after, and taken the steps to strengthen your online presence, it’s time to start tracking down leads! Truth: Knowing where to look is half the battle. You may instinctively gravitate toward job sites like CareerBuilder or Monster. And while these are pretty standard for the office job seeker, they’re not the best option for remote job seekers. Or, if you’re like me, you may find yourself as a newbie coming across ads on Facebook and Craigslist that promise work from home riches but are nothing more than MLM pyramid-type schemes. Fortunately, there are far better work from home jobs out there and plenty of places to find the quality leads you need to be successful — no programs, systems or startup fees in sight! Did you find a work from home job or freelance gig you’d be perfect for? Glad to hear it! Before you submit any ol’ resume or generic pitch, take the time to customize your submission. Every. Single. Time. Remember, as a soon-to-be remote employee, your resume is what gets your foot in the virtual doors of recruiters. And, as a freelancer, your pitch will be the thing that gets you the gig (or doesn’t!). Needless to say, you must put time into each one before you submit it. There’s no sense in laying the groundwork for a work from home job if you’re not going to follow through at this step! Today, there are no shortages of resume hacks you should be using to get your CV seen by recruiters. And freelancers can arm themselves with pitch-worthy techniques that help them stand out in the sea of competitors. Fortunately, I’ve got just the thing for you whether you’re ready to hack your resume or need help perfecting your pitch. You can access both by signing up for the free remote workers’ library below! You’ll gain access to the subscriber-only library and be one step closer to kicking your cubicle to the curb! Did I just throw a lot of information at you? Feeling a little lost? I’m here! Leave a question or SOS in the comments below. P.S. If you figured out that you’re definitely in the market for a remote employee position, you’ll want to check out my ebook, The Ultimate Guide to Finding a Full-Time Remote Job with Benefits. It’s 74 pages jampacked with actionable advice to help you kick your cubicle to the curb. You can grab it over at Gumroad for under $10. 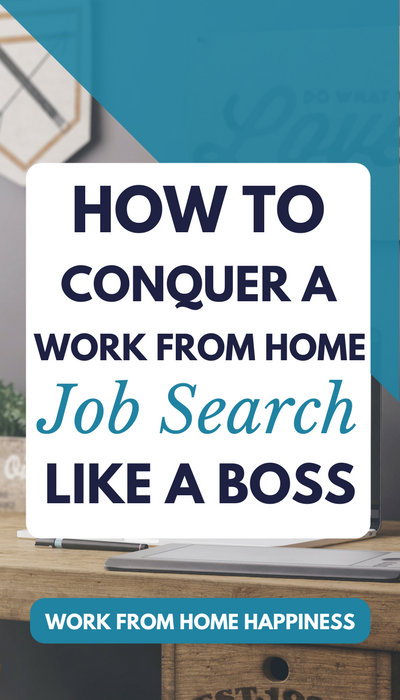 The post How To Conquer Your Work From Home Job Search appeared first on Work From Home Happiness.